Regatta is from November 12 - November 19 2019. Courses will be around the island of St. Martin, from St. Martin to St. Eustasiius, (Statia), 1 day of leeward-windward racing at Statia, from Statia to St. Barts, and finally from St. Barts to St. Martin. Boats will be be 51' Beneteau Sunsail charter boats, all new with 4 cabins and 4 heads, Air conditioned, electric winches, etc. Very nice accomadations. Airfare is included, estimated, and is from Charlotte to St. Martin direct on American Airlines. Price per person, estimated depending on airfare, is $1895.00 for the week based on 8 people. This includes $250.00 pp for food. Plenty of beer is provided for all boats. It includes cabin, 2 dinners, parties, airfare, and a whole bunch of fun! I am looking for 3 couples, 6 singles willing to share a bunk, 3 singles who don't mind doubling the cost, and the work of sailing a big boat, or a mix. It really works well with 8 people. No race will be started after 1:00 PM Sunday. We will try to run 3 races Sat, and 2 races Sun. No throw-outs. Plan to attend the cookout on Friday night at the ASC clubhouse. On Saturday night, we will have a cooked meal (surf & turf) with sides and dessert at the sailing club. Entry fee covers 3 people. Additional dinners are $15.00, kids under 12 eat for free. Please sign up for all additional dinners at time of registration. You are responsible for providing your own lunches. There is very limited grocery shopping near ASC, so plan ahead. There is an ice machine at the Club. There is ample camping available on the ASC grounds, with restroom and shower facilities available. 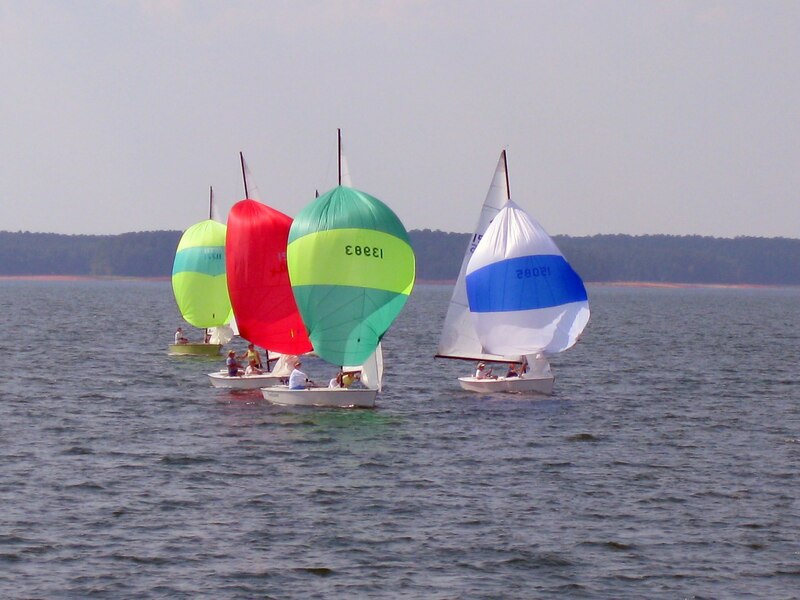 There are also many hotels on Washington Road, near 120, which is approximately 25 minutes from the sailing club. straight on 150. Go 4 miles and watch for the ASC sign on the left. From the North: take Interstate 20 into Georgia, exit on Bobby Jones (520) and go west (north). Go 1 mile and take a left on Washington Rd (104) and go to Pollards Corner (about 10 miles). Turn right on Hwy 150. Go 4 miles and watch for the ASC sign on the left. We need to know the number of dinners for Friday and Saturday night. Send me an email at bob@accesscpa.net so we can plan ahead. Thanks! Congratulation to our new Southeastern District champion Josh Putnam and his crew, Kate O'Donnell and Stanton Bost. 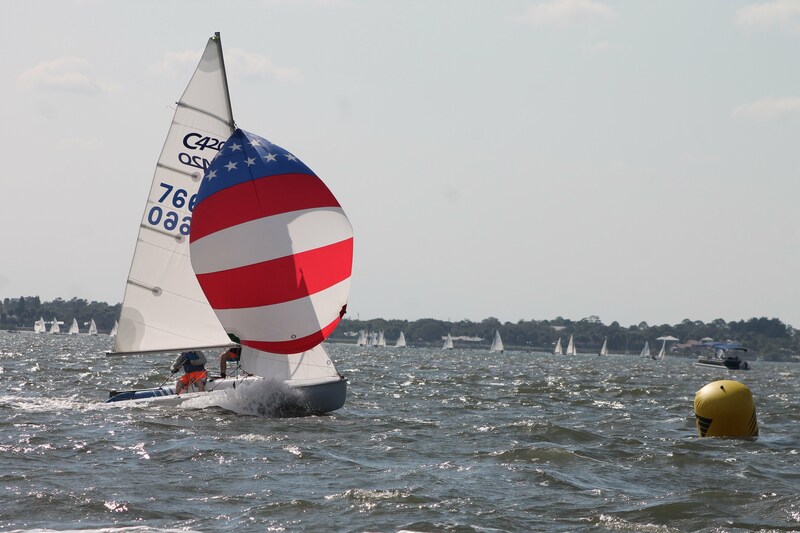 They sailed a great regatta, easily the most consistent boat out there. And it was a great regatta, we got in 8 races which due to the shifty conditions saw 7 different race winners. Beaufort Yacht and Sailing Club did a great job on and off the water. The steak dinner Saturday evening was outstanding. A lot of pictures were taken out on the water, will post a link to those as soon as I have it. A lot of ASC people went to Charleston Race week. we are waiting to hear how it was! Darrell Bragg is looking for crew members to participate in the 2016 Golden Rock Regatta out of St. Martin November 11-18, 2016. He has all the info and is looking for 3-4 people who would enjoy a week in the tropics sailing a 50' cruiser in 4 days of island to island racing and 1 day of mark to mark racing off the coat of St. Eustatius ( Statia ).